Our unique domain registration services, find a stunning name that is peppy and recallable on the internet, and book it instantly. Get a domain name registered today so that you do not get left out in the race to grow your clientele in the internet age. We will help you step into the online market with aplomb. "What's in the name?" Quite a lot if you are looking to create a niche identity when it comes to brand recall. Sometimes a simple and catchy name can help you gain publicity that would take years to emulate. Domain registration is the first step that brings you closer to your dream of getting internet savvy. With a unique name you can stand out among millions of businesses and carve a unique identity. 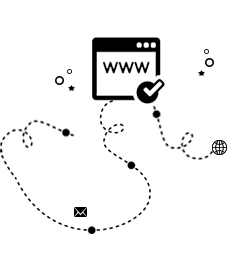 Millions of domains are available on the internet. Whether you want a domain on .com, .co, .biz or country specific domains depends upon where your market lies, what is your target market, what industry vertical defines your business the best. Some common domains are generic and can be registered irrespective of the business. Domain registration helps you cement your place in the market with a permanent address. You can use this name to create a proposition for your customer that you intend to service. This personal space becomes the front end as well as window that can get you online. We, at Interactive Bees, have the expertise to help you visualize the future for your brand and create a unique name around it. We provide guaranteed registration services that are cost effective with the option to book a name for as long as 10 years. We also provide you with the ability to mask your personal registration details in order to help you avoid unsolicited marketing calls.